Myanmar has urged Bangladesh to investigate and provide information about the list of "terrorists and criminals" belonging to the ARSA, which had been previously sent to Bangladesh, says Myanmar media. Myanmar Union Minister for Home Affairs Lt-Gen Kyaw Swe made the request during his meeting with Home Minister Asaduzzaman Khan held in Dhaka on Friday. Myanmar, earlier, sent a list containing names of more than 1,300 Arakan Rohingya Salvation Army (ARSA) members to Bangladesh. It was done at the 4th Myanmar-Bangladesh Central-Level Meeting on Border Security and Law Enforcement Cooperation held in Nay Pyi Taw on November 14, 2017. In addition, Bangladesh was also informed to extradite the ARSA extremists according to the 1980 Myanmar-Bangladesh Border Agreement so that action can be taken against them as per the law. During the meeting held here on Friday evening, matters relating to increasing work on border security and stability, combatting the illegal transport of drugs, sending back displaced persons from Bangladesh to Myanmar, increasing understanding and cooperation on security along the border of the two countries, terrorism and cross border crimes, and cooperation in combatting crimes occurring along the river border of the two countries were discussed, and the following was agreed upon. According to the Memorandum of Understanding on security sector discussions and cooperation, arrangements are to be made for regular meetings between authorised officials, according to The New Global Light of Myanmar, a Myanmar media outlet. Preparations for Deputy Minister/Secretary-level annual meetings are to be set and, if necessary, a minister level meeting is also to be held. To increase mutual understanding and cooperation, meetings between the Bangladesh Border Guard force and Myanmar Border Police force at different levels and sectors are to be continued. Liaison officers are to be assigned at basic, intermediate, central/top levels for mutual coordination, communications and exchanges of news. Exchanges between cultural and sports groups are to be scheduled, along with conducting the readings of papers, training programmes and study tours to establish cooperation. 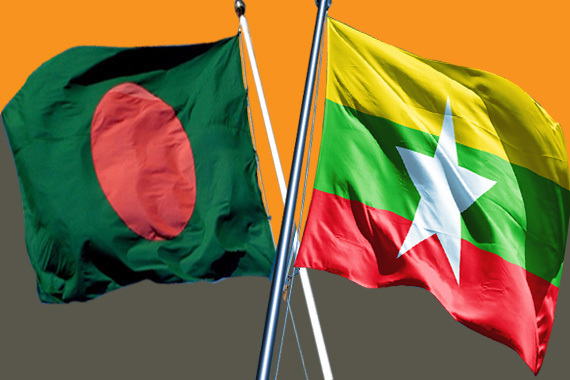 The quick setup of liaison offices is to be implemented for bilateral security and the rule of law in Maungtaw on the Myanmar side, and at Cox Bazar on the Bangladesh side, officials said.